Planit, the leader in woodworking software, is now offering a full line of design to CNC (Screen-to-Machine™) software systems right-sized to meet the needs of every shop size. Now even the smallest sized shops can take advantage of technology that allows them to easily engineer jobs on screen and send the necessary data straight from the software to their CNC machinery. 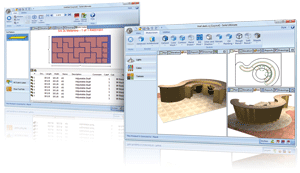 Planit’s Screen-to-Machine™ solutions allow users to create room layouts, produce photo-realistic renderings, bid jobs using actual cost/profitability info, and seamlessly produce accurate Machine Code for virtually any CNC machine. With multiple levels to choose from, small shops can meet the demands of their business as it grows by simply upgrading to more powerful modules. By utilizing this affordable software to automate their businesses with CNC machinery, these shops will be able to significantly decrease lead times, costly mistakes, and labor costs. CABINET VISION Solid Essential is an entry level design and manufacturing software tool that allows you to detail basic Kitchen Cabinet and Commercial Cabinet jobs. Solid Essential allows you to generate your shop drawings, 3D renderings, material requirements, part lists and basic estimating data. Graphically lay out your job to quickly create your shop drawings or use the built in Order Entry function to get a quick estimate.